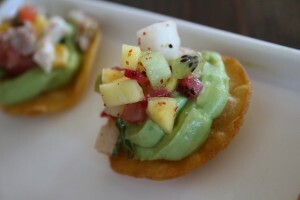 The Baja guacamole includes kiwi, jicama, strawberry, mango, mint and chile arbo. Happy Cinco de Mayo! This festival of fajitas has become a rather notorious day for partying, while of course celebrating Mexican independence. Alas, this year Cinco de Mayo falls on a Monday, so we’ve got to keep it pretty tame. 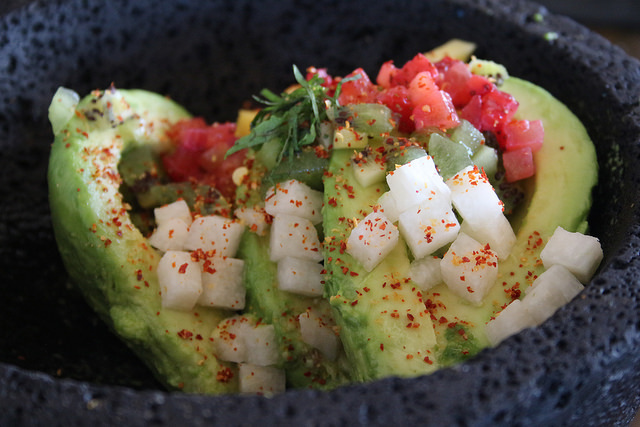 Our friend Hess at Witty + Pretty has a whole list of the places to get the best margarita in Atlanta, but to whet your appetite, Pretty Southern checked out the latest guacamole menu at Zocalo. Midtown’s Mexican kitchen and cantina is hosting its inaugural Guacamole Festival from now through Sunday, May 18. 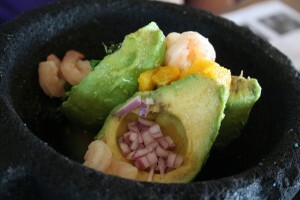 The Yucatan guacamole topped with fresh shrimp. 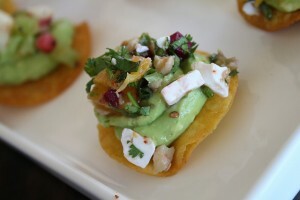 Guests can choose from a variety of guacamoles, including the Baja, Yucatan, Norteno, Pacifico and Sur which all include eclectic ingredients. The Yucatan guacamole features flavors from the Yucatan peninsula including shrimp ceviche, spicy salsa habanero, salsa fresca and orange (this was our personal favorite). 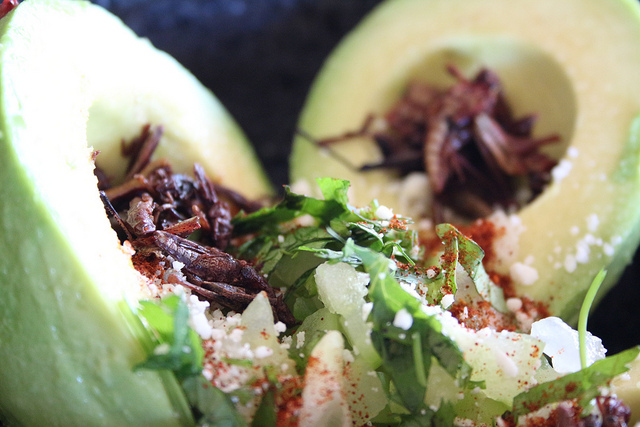 For a crazy combination, nay a double dare, the Sur guacamole features tomatillo, cotija cheese, onion, chile cascabel, cilantro…and grasshoppers! Can y’all see the grasshoppers? That’s right y’all, when we were there for our tasting, UPS dropped off a fresh supply of grasshoppers which are a traditional ingredient in Mexican dishes known as “chapulines”. We dare you to try it. For the less brave, try the Norteno guacamole including chicharron, pickled onion and salsa fresca. There’s also the option for a guacamole sampler which includes six tostadas topped with the Norteno, Pacifico and Baja guacamoles. Are y’all hungry yet? Zocalo is located at 187 10th St. NE, Atlanta, Ga., 30309, and can be reached at 404.249.7576. The restaurant serves lunch and dinner Sunday through Thursday from 11 a.m. to 10 p.m. and Friday and Saturday from 11:30 a.m. to 11 p.m. For more information, check out Zocalo’s website and Facebook page. Avocado is so delicious! This is pretty food lol! It looks great!